Distributor in the USA: Springer-Verlag New York, Inc. ISBN: 3-528-05828-5. Price: 34,90 € - 57,70 sfr - 34,95 US-$ - out of stock! The book is designed for an introductory two-semester course to give majors in computer science a solid foundation for further study and for nonmajors who will need to use computers effectively in their chosen fields. 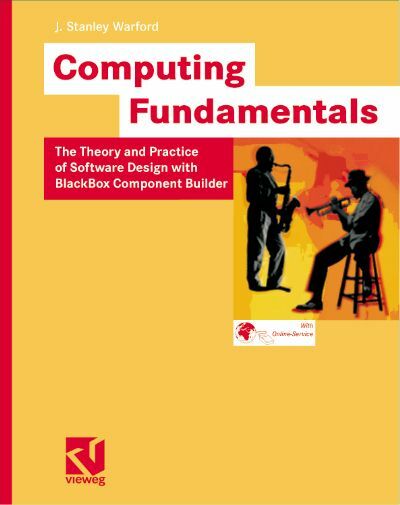 It is the first English book on Component Pascal and BlackBox Component Builder. The book introduces the reader to computer programming, i.e. algorithms and data structures. It covers many new programming concepts that have emerged in recent years including object-oriented programming and design patterns. The book emphasizes the practical aspects of software construction without neglecting their solid theoretical foundation. To explain the principles, concepts and methods, the component-oriented programming language Component Pascal is used, supported by the development environment BlackBox Component Builder. The book has been class tested and refined for many years. It is designed to be easy to teach and to learn from. Target groups are teachers and students of Computer Science at the university and junior college level. Prof. Dr. J. Stanley Warford has industrial experience as an aerospace engineer, has taught for more than twenty-five years at the university level, and has written several computer science books. He is currently Professor of Computer Science at Pepperdine University, where he received the Luckman Award for outstanding teaching. ... In this very readable and instructive textbook, Stan Warford has done the unusualand riskyby taking the programming language Component Pascal that is far from mainstream, although it does have roots that are among the strongest in the field. ... Stan succeeds in providing a highly original introduction to programming. One that alternates between the high-level aspects of immediate user impact, such as dialogs and views, and the low-level concepts of core programming, such as loops and recursion. As a result, students are always able to anchor what they learn in application scenarios that make immediate sense. The ability to create functional programs quickly, while not deviating to adopt an arsenal of 'dirty tricks', will help keep students motivated. The clean underlying approach and overall structure will at the same time lead to a deep understanding of principles and rigor.